Here is a quick idea to add some stylish romance to your Valentine's Day morning - Serve your honey (or treat yourself) breakfast/coffee in bed on a luxurious marble tray. I know that I said that the Ombre Vase was the easiest DIY project I've ever done, but this actually even easier! Note: The drawer handles are optional. You won't be able to carry heavy items on the tray by just holding the handles anyway, unless you screw them in. A handle-less tray is equally as stylish. 1. 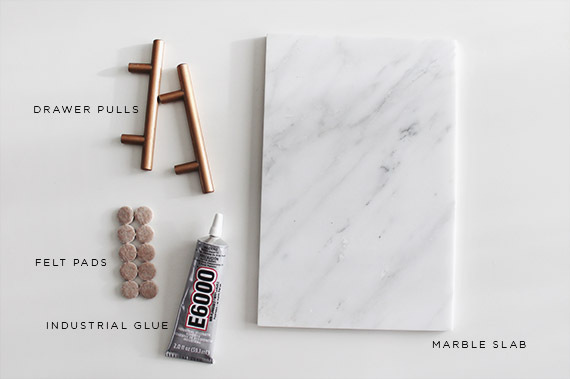 Flip your marble tray upside-down and stick a felt pad on each corner. The bottom of the tray is rough and would scratch your surfaces without them. 2. Measure equal distance from the edges to determine where to attach the handles. Mark the spot with a pencil. 3. Put glue on the bottom on one of your handles and stick it onto the tray. Hold the handle in place for a couple minutes. 4. Be careful not to put too much glue so it doesn't spill out the edges. If some glue does seep onto the tray then just wipe away with a cloth or Q-tip. 5. Repeat steps 3 and 4 for the second handle. 6. Let dry overnight before serving. 7. Assemble the food items on the tray and serve.